eyes, and a vaguely pixie/mousy cast to her features. Gargoyle -- much the same, petite and slim, except that her skin color is light grey, she has webbed wings, and a pterodactylian crest sweeps back from the crown of her head. Other: Aiden is never without a filigree heart-shaped necklace on a silver chain, a gift from Lex. She also often carries a "I (heart) NY" tote bag. met Kenneth Ferguson, who was doing a research project on the castle. thing in fanfic; just about everyone hooks Lex up with a girl via the 'Net <g>). and place in Central Park. This meeting changed her life forever. doesn't give herself enough credit, and isn't half the failure she thinks she is. "Gosh, you don't look anything like I pictured you." her that he is Lex, but luckily for Aiden, the genuine article shows up and rescues her. it turns out that Aunt Mary recognizes Lex, and vice versa. "I don't know what I just did, but I've got a bad feeling!" of Birdie Yale and Professor Lennox MacDuff. "Um ... just stand there, and think about being a gargoyle." Ebon, the amnesiac reformed Thailog) and battle some Quarrymen. "It's not like I could just raise it overhead and cry *invoco*!" "Oh, boy, talk about rotten timing!" results and it takes the help of Lex, Birdie, and Broadway to set things right. "I have the worst luck in the known universe." to Una and Leo's shop in London. He snapped it open and showed her a silver ring set with a small but sparkly diamond. "Will you marry me and be my mate? Now and forever?" game; to celebrate, they go to Disneyland and are surprised by a visit from skiff-travelers Broadway and Elektra. Aboard the sailing ship Columbia, Lex finally pops the question. "One thing I'm not looking forward to is getting my wings pierced." after she takes the big plunge and becomes a gargoyle. her arms to her sides on account of how round her middle had gotten." and a female. She also rings in the New Year by dumping a huge amount of water on a mob attempting to storm the castle, although she immediately feels horribly guilty about it. 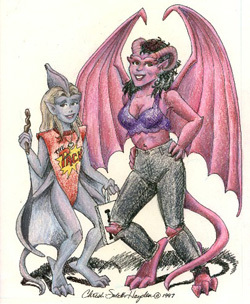 A Gargoyles Christmas Special -- Aiden joins Lex, Angela, and Brooklyn on a Christmas caroling expedition that takes them to visit both Demona and MacBeth. Sterling Academy, where a mystical plant known as Lady's Veil grows. Black Roses -- Aiden's brush with an incubus gives her a naughty dream about playing "professor, I really need an A" with MacBeth. Love Machine -- Aiden is reluctantly dragged along to Elisa's wild bachelorette party. The Wedding -- Aiden showers the newlyweds with twinkling magic light instead of rice. series of stories set in the future, with Amber as an adult and the hatchlings as youngsters). poor girl, I had to turn down the request). number of suggestions and submissions the Trek people would get). her on me. Besides, Aiden hardly meets the other qualifications. Her success comes mostly through blind luck and the intervention of others. one I think of whenever the Mary-Sue issue arises). Smith-Hayden, along with his partner Eric). mostly because it gets under her family's skin. him not until after his adventures on the skiff and subsequent change of heart). fast chums with Aiden and also developed a lusty crush on MacBeth. mimic, and very resilient -- no weirdness can stun her for long. she probably has a noddy dog in the back but this has never firmly been decided. glass-topped table during an argument over gargoyles. up some dickens in a bar with Brooklyn and Lex. smartass revenge involving a photo of him with a Snidely Whiplash moustache and a word-balloon reading "Curses! Foiled again!" place in The Scottish Rogue, a story due to be written in January of 1999.
will never happen ... probably ... maybe ... well ... we'll see. Of all my characters, I think Birdie and Gustav Sevarius get the best lines (with a few memorable exceptions, like Jericho and Brooklyn's "as above, so below" exchange). I used Birdie to shamelessly promote my own book once, in Lead Me Not ... when she refers to elves' ears <g>. about Griff in The Wedding.